Adventus: What's orthopraxis got to do with it? Editor's Note: This is NOT Rick. Nor is he even in this picture. Nice orthopraxis, though. The problem with all these discussions about Christianity and slavery is that they focus too narrowly. The evil is the unjust and arbitrary authority of one person over another, something that exists in different forms and degrees of severity in slavery, and serfdom, and employment. We have not yet learned how to live in society without such arbitrary grants. Even in a democracy (such as it is) we have the exercise of power, much of it arbitrary. Our system of "free labor" means that most people can have their lives shattered by an arbitrary firing--with certain exceptions, the prevailing "employment at will" doctrine allows anyone to be fired for any reason, or no reason. By and large, it is perfectly true, Christianity has not been a religion emphasizing social and economic reform. The early Christians did not call for the abolition of slavery; but they did call for a re-evaluation of human relationships within existing institutions. Jesus teaches a new model of lordship, the lord is the servant of all. Paul does not urge Philemon to free his slaves, but to treat that as children of God, on the same level as himself. In Roman law a slave was not a civil person. Christianity taught that the slave was indeed a person, and must be treated as one, even in the context of the relation of slavery. And as that treatment came to be seen as more and more incompatible with the harsher aspects of slavery, it was transformed. We see serfdom as something oppressive and applaud its abolition. But in the context of a collapsed Roman empire it was a practical social organization, and, unlike slavery, was based on mutual obligations, service for protection. Slavery is a form. Paul calls himself the "doulos" of Christ. We translate as "servant." We can translate as "slave." Neither is quite right in modern English. In the law our name for the field of employment law is still "master and servant." We continue to modify it, to make it more humane, adding protections against certain kinds of insidious discriminations, encouraging labor unions, regulating hours. It is a Christian impulse to humanize what is a more humane institution than slavery, but which is still a source of arbitrary power. Much the same story can be told about political authority. Christians did not denounce monarchy per se, but sought to teach the king his duties as a fellow Christian under the common fatherhood of God. Democracy in the ancient world was synonymous with the arbitrary caprice of the mob. We've learned to do it a little better, with separation of powers, and devolution of power to more local authorities, and limits on time and place, and the Church therefore promotes democracy as a political form. But it still is largely arbitrary, and, yes, our country, I would say, is still very much more a plutocracy than a democracy. One of the interesting things about the 13th amendment is that it doesn't abolish slavery. It allows it as punishment. And I understand that, today, there are more African Americans incarcerated in this country than there were slaves at the beginning of the Civil War. So we have far to go. Random thoughts, I know. Maybe I can get them organized at one point. I want to point out things like "free labor" also means I am free to reject your labor, and so free to leave you to starve, or die homeless in the gutter. Freedom leaves me quite free to not feel the need to be my brother's keeper at all. I want to say the major transformation of slavery, what made it the "peculiar institution" and our "hidden wound," was the addition of the 19th century concept of race to the mix. Slavery became a matter, not just of commerce, but of subjugation based on an argument of superiority based on skin color and little more. That was the truly pernicious twist the "New World" added to the practice. 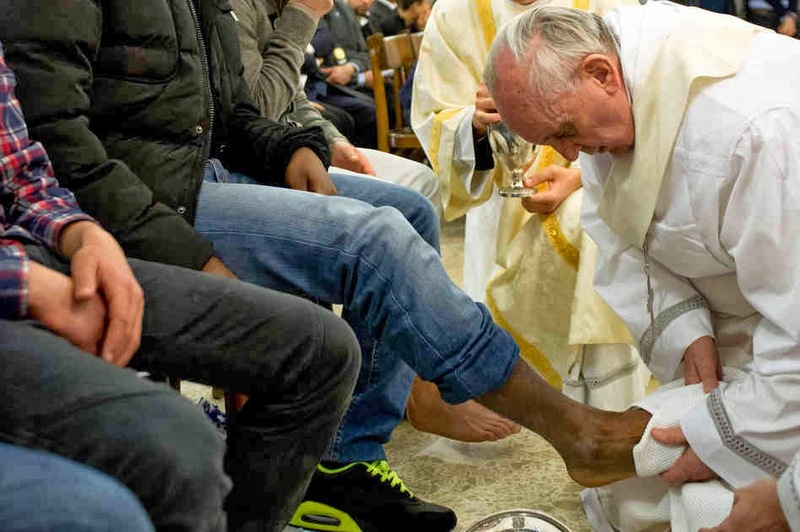 What emerges more strongly is not just a “preferential option for the poor” as a requirement to prioritise the treatment of the vulnerable, but the recognition that the poor may have spiritual insights into the Gospel message that others may lack. It takes “blessed are the poor” more literally and does not reduce it to being “poor in spirit” as a mere attitude of mind. Thus it privileges rather than patronises the poor. Wealthy and even middle-class Catholics might find that disturbing, but discomfiting the comfortable is no bad thing. This is clearly the example – renewed on a daily basis – that Francis is setting by his own lifestyle, which the theology itself calls orthopraxis. The highlighted sentence is the one I want to focus on, because that idea strikes me as both dangerous and essential, both central and marginalizing. Which, to me, means it contains more than a grain of gospel truth to it. Actually the Beatitudes would be a better starting point, if only because that's what's referenced in the quote just above about "orthopraxis." But the Magnificat is a clearer statement of what I think a theology that "privileges rather than patronises the poor" means. It is that "privileges"that might disturb us, because surely equality is the purpose of the gospels? Well, not if the first of all is the last and servant of all. Jesus rather explicitly establishes a "race to the bottom," something even more radical than telling Philemon to not abuse his runaway slave (Paul's house church and eucharisto are actually even more radical than his letter to Philemon, if only because there the entire "house" (which would include servants as well as children, who were not the admired creatures of our loins that they became after the Victorian era) ate a common meal (imagine that happening, ever, at "Downtown Abbey" and you'll have some idea). If the poor are actually privileged, then it is a privilege to be poor, and so "Congratulations to you poor!" are certainly in order. Which is the real radical ("to the root") message of the Gospel. Does the Church follow that message? Some would say not since the group of believers Luke described in Acts. But the church is to be ever reforming and ever reformed, and so turning to orthopraxis is a starting point, not a goal. To condemn the church for never reaching perfection is like condemning medicine for not curing all the ills flesh is heir to; better to look for the lit candles than simply to curse the darkness. I would say more, but there isn't time to. Let Rick's remarks (especially) and whatever else is here be enough. If I were wise, I would try to make it a focal point; or at least make something out of it. "Editor's Note: This is NOT Rick." Certainly not. I couldn't wear that white outfit for ten minutes without getting mustard or a coffee stain on it.